Ok here are your typical catalytic converter on a N63 or N63tu,,,,customer said check engine light came on,,,,we found rich mixture faults and bank 1 catalytic converter low efficiency ,,,,performed a catalytic converter test,,,but that didn’t help,,,so welcome to modern technology,,,,I took a bore scope and removed the down pipe and found the catalytic converter damaged. So this job is not that bad,,,you have to remove the heat shields and vacuum pump to gain enough room to remove the catalytic converter,,,,if you are replacing bank 1 catalytic converter you don’t have to remove bank 2 catalytic converter,,,,,but if you need to replace bank 2 catalytic converter then you have to remove bank1 catalytic converter first to gain access,,,,so I got lucky just bank1 catalytic converter is coming out. Here the whole catalytic converter removed with part of the down pipe,,,,which snakes behind the engine to the exhaust pipe. 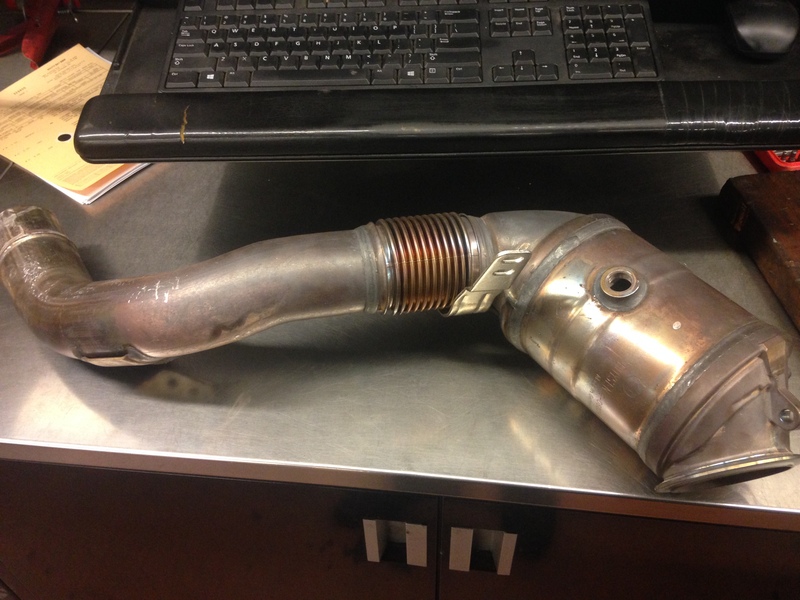 This entry was posted in Uncategorized and tagged catalytic converter, N63. Bookmark the permalink. 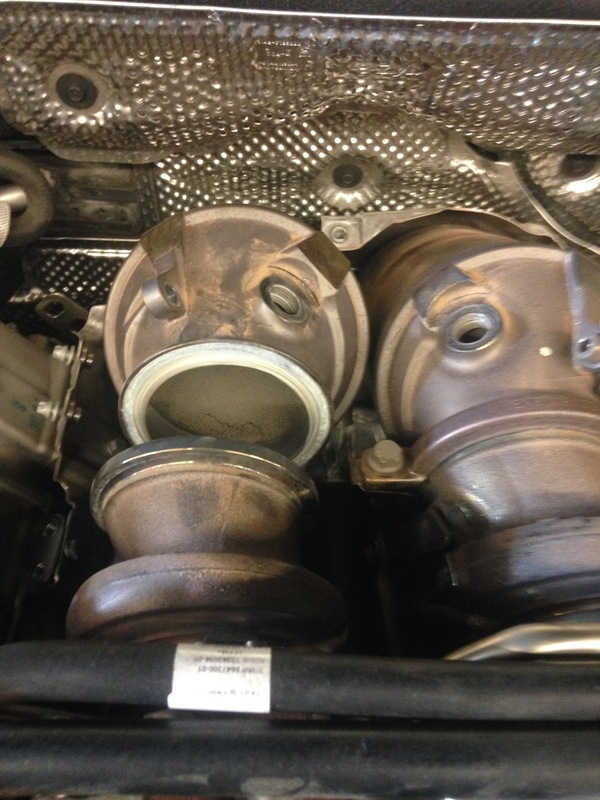 I’ve heard something about the N63 turbo oil return lines getting clogged up with sludge and allegedly causing turbos to fail from running dry. Are there any symptoms to watch out for? Is there any way I can check if it’s happening to my engine using basic tools and an OBD scanner capable of logging parameters over time? No we haven’t heard about that,,,,the turbo oil return hose is a all metal line,,,,,I have yet to see or experience that problem yet. Thanks a lot for the great posting. It’s really helpful to understand and look over the general issues on the N63 engines. By the way, what kind of the damage occurred to the catalytic converter? The damage to the catalytic converter was that it cracked,,,it was hard to show in the pictures,,,,but the honey comb cracked,,,,ok the problem wasn’t the heat,,,,the problem was the fuel injector were dumping fuel into the engine on bank1 ,,,,two weeks earlier,,,,,,so the car came back 2 weeks later with catalytic converter problem,,,,ok your turbo blanket,,,,there is no room under the heat shields for a blanket. Ok thanks a lot for the detailed information! 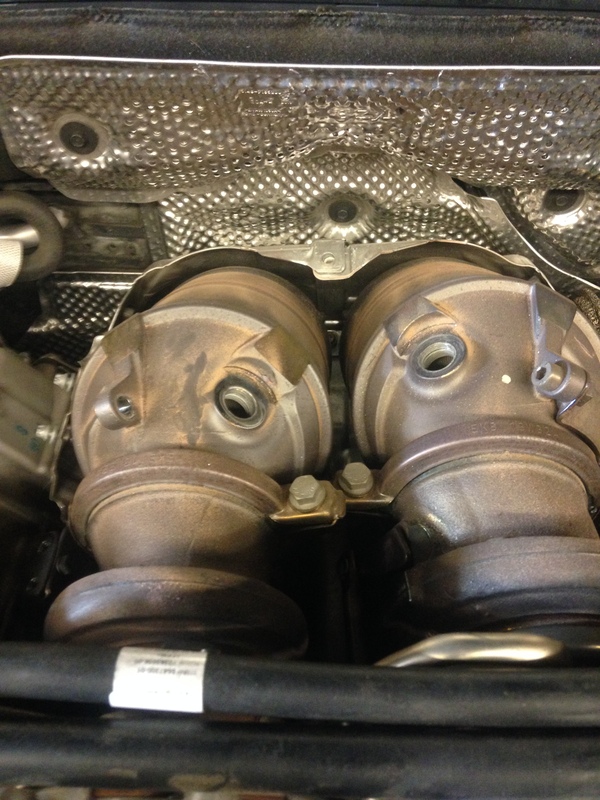 do you have had problems with leaky exhaust manifolds (itselve or gaskets) on N63 engines? Or is this not very common?